CAPE is an ACC accredited and is able to treat a range of musculoskeletal and sports injuries. Located at 405 King Street North, Hastings CAPE is an ACC accredited physio service treating and rehabilitating a large range of musculoskeletal and sports injuries. ACC Consultations are $15 per visit (adults) and $10 per visit (students and children). Non ACC visits are $55. At CAPE we will assess your injury and develop a full treatment package with advice on pain management and how to manage your injury. To make an appointment phone (06) 873 8560. The casting clinic provides timely and quality care to both enrolled and casual patients. 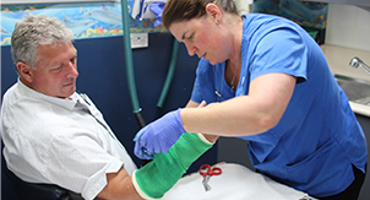 Our casting clinic provides timely and quality care to both enrolled and casual patients and is operated by our casting clinic nurses and Urgent Care doctors. 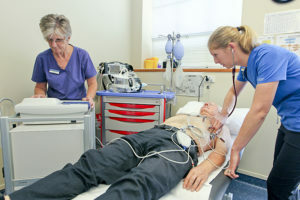 We are able to treat most types of minor fractures, however more serious fractures are referred to Hawkes Bay Hospital. 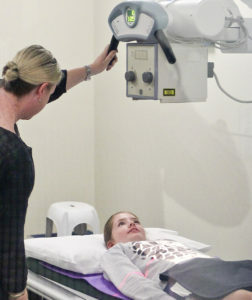 X-rays are carried out in Radiology which is located in GP1. There is no charge for an ACC x-ray. The Casting Clinic operates every Tuesday and Friday. Appointments for the Casting Clinic are made through a referral from a GP or through Urgent Care. This service is free to all enrolled patients. This service is free to those patients who are enrolled with a GP at The Hastings Health Centre. Referrals are taken from the doctors, practice nurses and other pharmacists to manage medication issues that come up with a change in medicine regime, a stay in hospital, complex medicine regimes (insulin, warfarin, reducing doses, specialised treatments, coming off long-term medication), interactions, side effects, using devices, or simply getting on top of what should be taken when and sorting the rest. 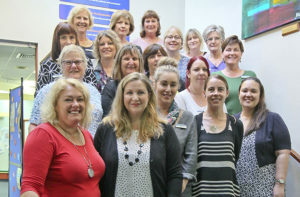 The Hawkes Bay District Health Board fund this service. Appointments for this service are available Wednesday, Thursday and Fridays. 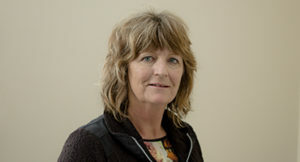 Jenni can be contacted on phone (06) 873 8575 or email jenni.jones@hhc.co.nz. You are also able make an appointment through Manage My Health. This clinic provides advice on all aspects of managing diabetes. 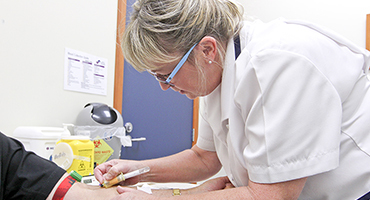 Our Diabetes Clinic is tailored towards high needs patients who have either been referred from one of our family doctors and nurses and/or Hawke’s Bay Hospital. 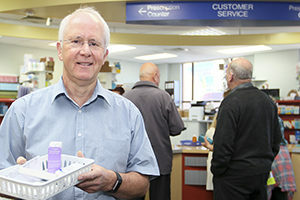 Supported by the Hawke’s Bay Primary Health Organisations (PHO) and Hawke’s Bay District Health Board (DHB), patients who have been referred to the clinic can expect to receive advice on all aspects of managing their diabetes in a supportive and caring environment. Appointments for the service are available on Tuesday afternoons and Friday mornings. Our team of District Nurses enables us to maintain a high level of care for our patients. The Hastings Health Centre has a core team of District Nurses employed by the District Health Board who look after our patients. 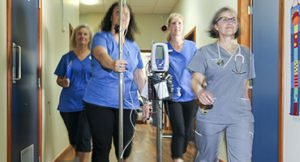 The nurses are available on site every day except Wednesday between 1:30pm to 3pm. During this time they are available to see patients or discuss any plans of care with a doctor or practice nurse. The close working relationship our core team of district nurses have with our family doctors and nurses benefits the patient and assists with a coordinated approach to patient care. Our Ear Nurse Specialist (ENS) treats all acute and chronic ear problems. 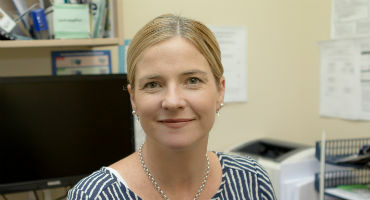 The Hastings Health Centre runs the only ear micro-suctioning service in Hawkes Bay. The Ear Clinic treats all acute and chronic ear problems such as infections, wax impaction, discharge and foreign body removal. 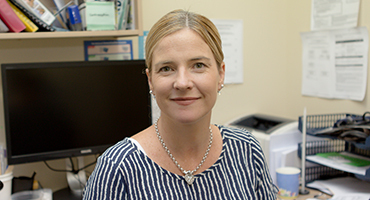 The ear suctioning service provided by our ear nurse specialist (ENS) Frith Gray is endorsed by ACC due to the decreased risk of perforation and possible damage to hearing. The ear suctioning service that Frith provides is an alternative to syringing and treats all types of ear problems including wax impaction, discharging ears and foreign body removal. A high-spec, purpose-designed microscope is used to get a complete view of the ear canal and ear drum, allowing thorough diagnosis and treatment. Please call GP5 on (06) 873 8590 or email frith.gray@hhc.co.nz to book an appointment. 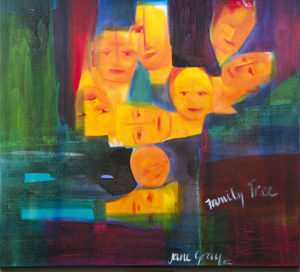 We're a safe place to talk about family violence. The Hastings Health Centre is a safe place to talk about family violence. 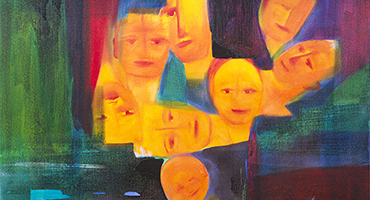 Our Family Violence Programme was introduced in 2008 in order to continue to provide our patients with holistic care and protect their physical and mental wellbeing. Our family doctors and nurses have been trained to recognise the signs of family violence through asking the right questions. Our programme is supported by the Hawke’s Bay Primary Health Organisation and the Hawke’s Bay District Health Board. If you are suffering from abuse our staff are able to support, advise you of your options and can refer you to the right agency for your protection. If you would like to seek help or are worried about a family member, you can talk in confidence to a family doctor, nurse or support person. If you are hurting the people you love and need help to stop we can give you information for agencies in our community that will help. You will be provided with this information and our support and will not be judged. 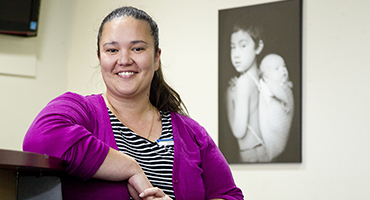 We provide holistic support to all enrolled patients through our Kaiawhina service. 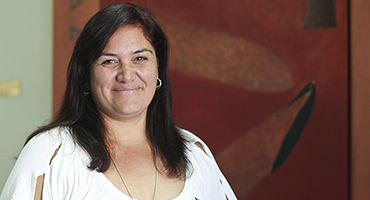 Our Kaiawhina Wendy King is here to support patients and help them navigate their way around health services. She can advocate and act as a liaison person for patients. 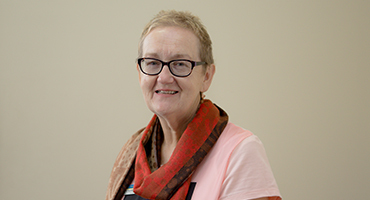 Wendy provides holistic support to our enrolled whanau and families in the region. To request our Kaiawhina service please speak to your family doctor, nurse or receptionist. Wendy works Monday to Friday 8:30am to 5pm. We are committed to addressing the needs of Maori and Pacific people. With more than 5,000 Maori and Pacific patients enrolled we are one of the largest provider of primary health care to Maori and Pacific communities in Hawke’s Bay. The Hastings Health Centre is committed to addressing the needs of Maori and Pacific people by acknowledging the disparity between the health of these minority groups and the rest of the population. 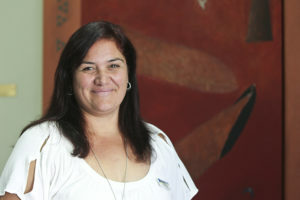 The service is funded by Health Hawke’s Bay and is coordinated by nurse Louise Singh. Blood and specimen testing is done by our Medlab team. We pride ourselves in providing a superior service to all Hastings Health Centre patients who require blood or other specimens collected for laboratory testing. Clients who need tests for immigration, insurance, travel, pre-employment purposes are also welcome. The Medlab team are all fully qualified Phlebotomists with many years of experience. The service is IANZ accredited and audited annually. Our professional and caring staff will make your visit a pleasant and comfortable experience. We are conveniently located within The Hastings Health Centre with a further collection centre being situated at 62 Munroe Street, Napier. The Medlab is open Monday to Friday 8am to 5pm. Catrina has advanced education and specialised clinical training in children and youth under 24 years of age. Catrina is the Nurse Practitioner at The Hastings Health Centre. 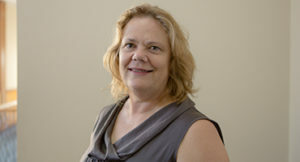 She has advanced education and specialised clinical training in children and youth under 24 years of age. She is able to provide you with information and support about issues such as toilet training, temper tantrums and picky eating as well as assess, diagnose and treat acute illnesses such as respiratory infections, ear infections, rashes, and UTIs. Catrina is also able to manage chronic conditions such as asthma, eczema, constipation and acne. Our nurses are qualified to provide you with the best medical and healthcare advice. The range of nursing services available at The Hastings Health Centre is second to none. With more than 25 nurses employed at the Centre, each nurse is qualified to provide you with the best family medical services and healthcare advice. The highly skilled nursing team are able to offer a range of services across all ages. Well child checks include B4Sc checks. Access to free services for our high needs population. Assisting the Dr with minor surgery and removal of sutures. *Access to these services may be free for our high needs population free services for our high needs population. Improve the health of your workplace. The Occupational Health Nurse works with a number of industries and health care providers to improve the health and wellbeing of an individual or group at your workplace. 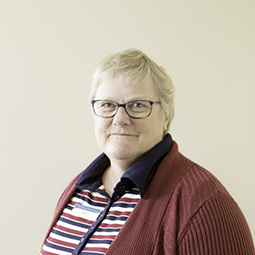 Our Occupational health nurse is able to provide nursing care and can provide advice on health promotion, health maintenance, injury prevention and rehabilitation. Since the unit is based at The Hastings Health Centre we can also offer all family medical, radiology and laboratory services. We also work with CAPE Physio to provide Functional Capacity assessments, if required. Our podiatry clinic treats a number of common foot complaints and injuries. 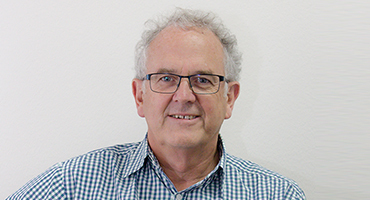 David gained his Diploma in Podiatry in 1986 and has been dealing with work complaints for the past 30 years. He spent his first three years working in Australia, gaining experience working in private practice, hospitals and Community Health Centres. He then completed a Bachelor of Science Degree with Honours through The University of Brighton in England. While fixing feet might not be for everyone, David finds it a very satisfying career. 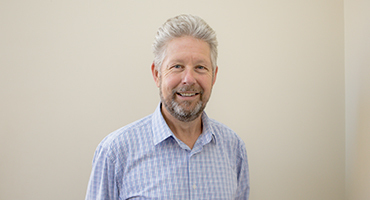 Podiatrist David Greenhill treats a number of common foot complaints such as corns, callouses, heel and arch pain, ingrowing toe nails, children’s foot conditions, arthritic and diabetic foot disorders and sports injuries. 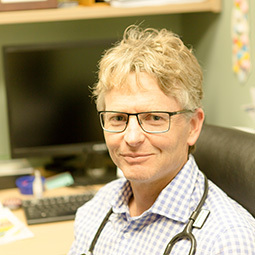 He is committed to providing the best care for his patients and values the benefits of working at The Hastings Health Centre with so many other experienced health professionals. 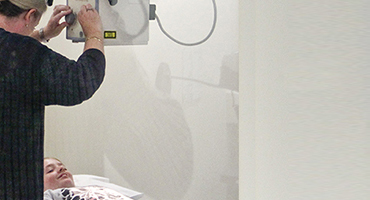 We use film-less imaging to deliver a fast turn around of high quality images for diagnosis. Please ask us if you require your images to be seen by a specialist or health professional outside of Hastings Health Centre. We operate by an appointment system and have the flexibility to allow for urgent appointments. All ACC related x-rays are free. All non ACC x-rays will be charged to the patient, so please make sure ask about costs when making your appointment. Patients requiring immigration x-rays are welcome. Opening hours: 8.30am to 5pm (closed for lunch 12.30pm to 1.30pm) Monday to Friday. Open on weekends and all public holidays (except Christmas Day) 12pm to 4pm. Located in GP1. Please call (06) 873 8507 to book an appointment. Our sexual health service is free to everyone under 21 years-old. Sexual Health Services at The Hastings Health Centre are free to all under 21 year olds. Our sexual health service covers all contraception services, treatment of STIs (sexually transmitted infections) and pregnancy testing. This service also covers cervical smears, jadelle insertion , depo provera injections and the morning after pill. Our Skin Lesion Clinic offers a full range of services. Concerned about a mole or skin cancer? Want to remove that cyst? Need to undergo topical skin treatment for sun damaged skin? Our Skin Lesion Clinic offers a range of services including skin examinations, skin surgeries and non-surgical treatments for skin cancers. All patients can expect to receive expert care and treatment at the Skin Lesion Clinic, which is housed in GP2. To make an appointment please contact GP2 on (06) 873 8596. Our social worker is here to support families through their healthcare experiences. Our social worker Eleanor O’ Rourke is qualified to offer counselling, advocacy and support to physical health and disability issues. She is also able to provide assistance in helping people to deal with the emotional issues and changes in their lives. 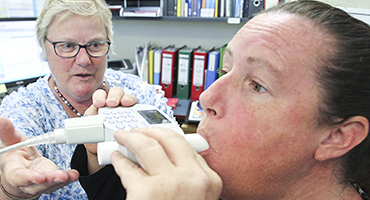 We provide support to a number of patients who suffer from respiratory conditions. The aim of our Spirometry clinic is to diagnose/confirm lung disease, educate patients, thereby empowering them to self manage their condition with continued support of their medical team. An initial assessment is done by your doctor or nurse and if appropriate, a referral is made to the respiratory clinic. 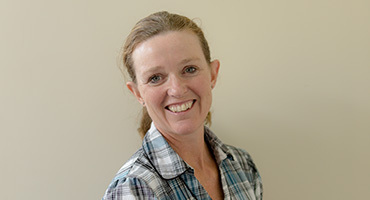 The clinic is run by our respiratory nurse Barb Dooney. The Pharmacy offers a full range pharmaceutical and health services. 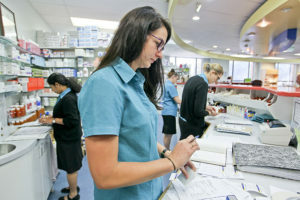 Our great team at The Pharmacy is here for all your prescription and pharmacy needs. We work within Urgent Care’s opening hours, 8am to 8pm, seven days a week. 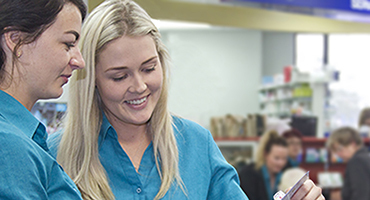 We are here to help you and for The Hastings Health Centre’s enrolled patients, we’ll even pick up your prescription from your GP Suite and dispense it for you – all you need to do is pick it up when you are ready. Opening hours: 8am to 8pm Monday to Sunday. To make an appointment contact (06) 873 8585. 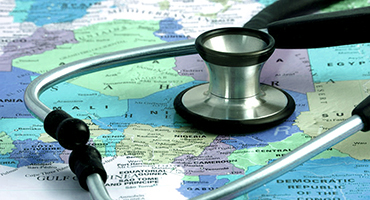 Our Travel Medicine service offers a full range vaccinations for all ages. Planning to travel or moving overseas? Our Travel Medicine Service will provide all your health and medical requirements for all ages. Our travel medicine service is managed by Dr Colin Dykes, who is based in GP3. Colin is able to provide you and your family with personalised advice and programmes which match your age group, type of travel and the destination you plan to travel to. Opening hours: Thursday mornings 8.30am – 11:15am. Other days and times by arrangement only. To make an appointment call (06) 873 8525 or come into GP3. Appointments are unable to be made using Manage My Health. The Hastings Health Centre’s Urgent Care service is your one stop ‘walk in’ medical and health care service. Urgent Care Clinic is our walk in accident and medical healthcare service. No appointment is needed. Urgent Care is open seven days a week from 8am to 8pm including public holidays and is available to anyone including visitors to Hawkes Bay. Every patient is triaged by a nurse on arrival to help with assessing priority of treatment. 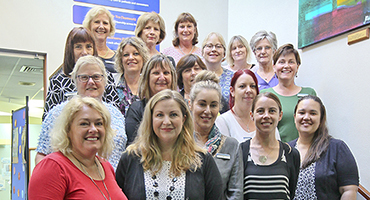 Our department is CORNERSTONE Accredited and meets NZ Urgent Care 2015 Standards and ACC benchmarks. Dr Alan Wright performs this procedure in GP6 and is Southern Cross accredited. A vasectomy is a surgical procedure for male sterilisation or permanent contraception. Dr Alan Wright performs this procedure in GP6 and takes around 45 minutes. Dr Wright likes to see you initially to discuss the procedure and to do an examination. The vasectomy procedure is booked after this initial ‘chat’. Please see your own GP if you have a Community Services Card as you may qualify for a funded (free) vasectomy. For those paying for the procedure, the initial consultation is $60 and the vasectomy procedure is $389. Dr Wright is an accredited provider for Southern Cross and most insurance companies cover the cost. 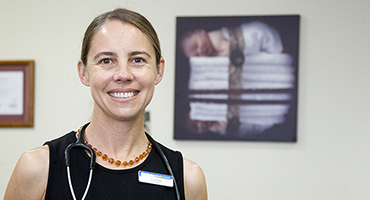 You can phone GP6 directly on (06) 873 8580 to book an appointment or talk to your family doctor to get a referral.